Please read the terms and conditions (“Terms and Conditions”) set out below carefully before making any bookings from this Website. By making any bookings from this Website, by phone, by instant messaging, or by our mobile applications you agree to be bound by these Terms and Conditions. Hungry Hub is provided as a service of AppServation Co., Ltd. For the purposes here of, Hungry Hub and AppServation Co., Ltd. are collectively referred to as the “Company”. The WebSite(s) are offered to you conditional on your acceptance without modification of the terms, conditions, and notices contained herein. Your use of the Hungry Hub WebSites constitutes your agreement to all such terms, conditions, and notices. For the purposes here of, Hungry Hub WebSites(s) and mobile applications are collectively referred to as the “WebSite”. The WebSite is protected by appropriate security measures. Access to and use is restricted to Authorised Users only. Any attempt to use the system in a manner not authorised or any attempt to alter, destroy or damage any Information contained within it may constitute a breach of the provisions of computer act and/or legislation and shall leave the User liable to both criminal and civil proceedings. It is strictly forbidden to attempt to access the system using any third party’s log in identity. Anyone using the System consents to active monitoring for security policy compliance purposes. The Company provides an online web application for restaurant owners who have agreed and signed a Restaurant Partner Service Agreement with the Company (each, a “Restaurant Partner”) to manage bookings, seat allotment, customer contact information, reviews from a web-enabled device and to provide restaurant consumers (each, a “Customer”) with a fast, friendly way to search and book tables from a web-enabled device. The Company does not sell any products and is not a party to any transaction or any agreement a Customer may make with a Restaurant Partner with regard to any food, product or service offered by such Restaurant Partner other than stated on the WebSite. 2.1 Booking a table By making a booking through the WebSite, a Customer enters into an agreement with Hungry Hub with respect to booking a table with a Restaurant Partner. The Restaurant Partner remains responsible for food, products or services including, without limitation, any price, promotions, programs, policies, services, or other information as posted on the WebSites. When a booking for a table at a Restaurant Partner is confirmed, a Customer will receive a booking confirmation with a booking ID and booking details via the email address and an SMS via the mobile number the Customer provided to Hungry Hub. The Customer must inform Hungry Hub immediately if any details of the booking confirmation are incorrect. Any messages from Hungry Hub or the Restaurant Partner to the Customer without a valid booking ID cannot be used as a booking confirmation. Any bookings made through the WebSites less than the minimum advance booking time set by the Restaurant Partner (“Last-minute Bookings”) are not guaranteed and the confirmation of Last-minute Bookings is at the Restaurant Partner’s sole discretion. Customer is required to present a booking ID upon arriving at the restaurant. In the case that a Customer fails to present a valid booking ID, the Restaurant Partner has no obligation in providing the Customer seats at the restaurant. Customer may modify the booking details up to 30 minutes before the booking time. The booking modification is subject to seat availability. By confirming the booking modification, the Customer accepts any changes, including, but not limited to changes in menu, price, restaurant details, which may have occurred during the time of the original booking and the modification. The Customer will receive a booking update with a new booking ID. Booking confirmation made through the WebSites is intended for Customer’s use only and the Customer warrants that any bookings made by the Customer are not for resale and that the Customer is acting as principal only and not as agent for another party when receiving the services. Customer agrees to take particular care when providing Hungry Hub with his/her details and warrants that these details are accurate and complete at the time of booking. The Customer also warrants that the credit or debit card details provided is for his/her own credit or debit card and that it has sufficient funds to make the payment. Hungry Hub reserves the right to alter the services available for booking on the WebSites and to stop listing Restaurant Partners or services. Hungry Hub may send email or SMS confirmations to confirm or follow up on bookings or to request a review or follow up feedback. Kids taller than 130 cm are counted as adults. All prices listed on the WebSites are correct at the time of publication; however, Hungry Hub reserves the right to alter these in the future. Prices are inclusive of the relevant VAT and service charges, unless otherwise stated. The prices listed on the WebSites are promotional price exclusive for the Customers. The price the Customer will pay is guaranteed to the booking ID. The full payment of the price will be made to the Restaurant Partners directly at the time of dining, unless otherwise stated. Some Restaurant Partners may require a credit or debit card number to finalise the booking as a guarantee. In order to use the booking services for these Restaurant Partners, a Customer must provide valid credit or debit card information. To confirm that the credit or debit card information the Customer provided is accurate, Hungry Hub may place a temporary authorisation on that credit or debit card at the time it was provided to Hungry Hub. 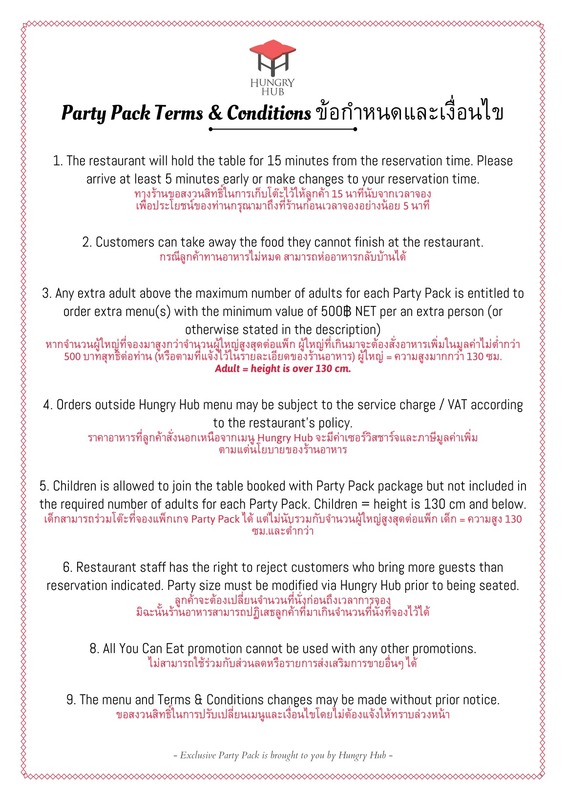 Hungry Hub is committed to providing superior quality services to Users and in order to assist us in maintaining a consistently high level of service for the Restaurant Partners and Customers, a Customer must cancel any bookings that they will be unable to honour at least 30 minutes in advance of the booking time. The Customer may cancel his/her booking via the WebSites or by calling the Restaurant Partners directly. Any pre-payments required to finalise the booking is refundable to the Customer’s Account as Hungry Points. If a Customer is unable to keep his/her booking and he/she fails to cancel at least 30 minutes in advance of the booking time, Hungry Hub will send the Customer an email letting him/her know that our records indicate that the Customer was a no-show. By using the booking services, the Customer agrees to receive no-show notifications by email after a report that his/her booking was not honoured, whether or not that was in fact the case. The Customer agrees that all final no-show determinations will be made by Hungry Hub in its sole discretion. Any pre-payments of the bookings failed to cancel 30 minutes in advance of the booking time is also non-refundable. Customer may be able to participate in Hungry Hub’s Customer rewards program (“Hungry Points”). Participation is subject to the Hungry Points Terms and Conditions. The Company does not have and will not assume any responsibility for, or liability related to, any food, products and services offered, sold or provided by the Restaurant Partner, that differ from the information listed on the WebSites. Customers should direct any questions, complaints or claims related to such food, product or service to the appropriate Restaurant Partner. The Company does not warrant that products or descriptions, or any other content of the WebSites is available at the booking time. Restaurant Partner must ensure that the listed food, product or service on the WebSites are available at the booking time. In the case of ingredient shortage, an appropriate replacement menu is to be offered to the Customer and the Restaurant Partner may inform the Customer prior to the booking time. The Company is not liable for any delays, inaccuracies, errors or omissions with respect to the information or the transmission or delivery of all or any part thereof, for any damage arising therefrom or occurred thereby, or for the results obtained from the use of the information. The Company is not liable for any acts or omission of acts of any Restaurants. The Company assumes no liability, obligation or responsibility in connection with any transactions between a Customer and a Restaurant Partner, concluding, but not limited to, failure by either party to keep a booking, a Restaurant Partner’s knowledge (or lack thereof) of any Customer’s food allergies, injuries and/or damages sustained or caused by a Customer at a Restaurant, a Customer’s or any employee’s behaviour at a Restaurant Partner or the quality of the food, service and products at a Restaurant. If a Customer has a dispute with a Restaurant or any third party, all parties release the Company (and its agents and employees) from claims, demands and damages (actual and consequential) of every kind and nature, known and unknown, suspected and unsuspected, disclosed and undisclosed, arising out of or in any way connected with such dispute. Any information on the WebSites can change without notice. The Company provides an online web application for restaurant owners who have agreed and signed a 3rd party restaurant service agreement with the Company (each, a “3rd Party Restaurant”) to manage bookings, seat allotment customer contact information, reviews from a web-enabled device and to provide restaurant consumers (each, a “Customer”) with a fast, friendly way to search and book tables from a web-enabled device. The Company does not sell any products and is not a party to any transaction or any agreement a Customer may make with a 3rd Party Restaurant with regard to any food, product or service offered by such 3rd Party Restaurant. The Company does not sell, license or endorse any of the 3rd Party Restaurants participating or listed on the WebSites and does not act as an agent of sale or an agent of any merchant or provider of food, products or services. The Company does not have and will not assume any responsibility for, or liability related to, any food, products and services offered, sold or provided by the 3rd Party Restaurant or listed on the WebSites. Customer should direct any questions, complaints or claims related to any food, product or service to the appropriate 3rd Party Restaurant. The Company does not warrant that products or descriptions, or any other content of the WebSites is accurate, complete, reliable, current or error-free. WebSite content is provided for informational purposes only and the Company shall have no liability for inaccuracy or incompleteness in product or service content, user ratings or commentary, or other content on the WebSites. The Company is not responsible or liable for any food, products, services, information or other materials displayed, purchased, or obtained by a Customer from the 3rd Party Restaurant or the WebSites. The Company does not endorse, warrant or guarantee the food, products or services of any 3rd Party Restaurant, including, without limitation, any seat availability, prices, promotions, programs, policies, services, or other information posted by any 3rd Party Restaurant. The Company is not liable for any delays, inaccuracies, errors or omissions with respect to the information or the transmission or delivery of all or any part thereof, for any damage arising therefrom or occasioned thereby, or for the results obtained from the use of the information. The Company is not liable for any acts or omission of acts of Hungry Hub or any 3rd Party Restaurant on the WebSites. Customer accepts the entire risk as to the accuracy, adequacy, completeness, currency, validity and quality of any information relating to the food, products or services provided to Customer by a 3rd Party Restaurant. By making a booking for a table at any 3rd Party Restaurant through the WebSite, a Customer enters into an agreement with a 3rd Party Restaurant. The 3rd Party Restaurant remains responsible for seat allocation, food, products or services including, without limitation, any availability, price, promotions, programs, policies, services, or other information. Customer will receive a booking confirmation with a booking ID and booking details via the email address the Customer provided at the time of booking. 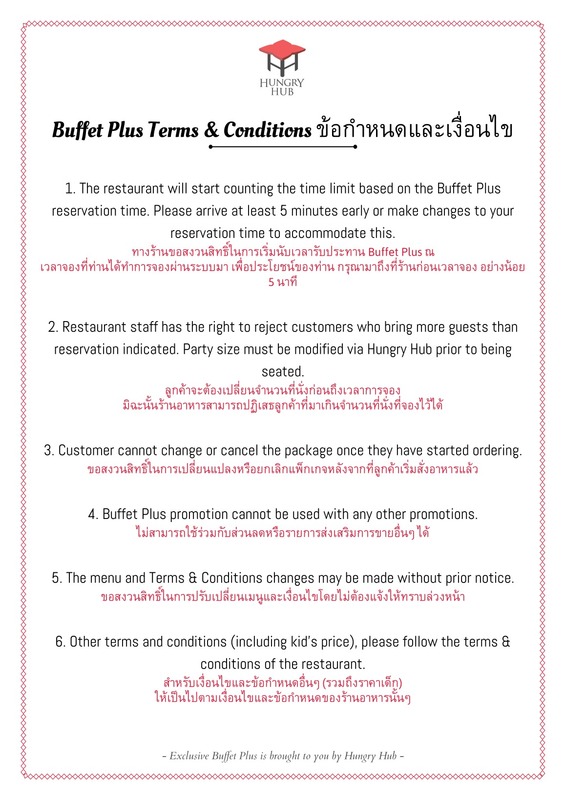 The Customer must inform 3rd Party Restaurant immediately if any details of the booking confirmation are incorrect. Customer may modify the booking details up to 30 minutes before the booking time. The booking modification is subject to seat availability. By confirming the booking modification, the Customer accepts any changes, including, but not limited to changes in menu, price, restaurant details, which may have occurred during the time of the original booking and the modification. The Customer will receive a booking update with a new booking ID. Hungry Hub reserves the right to alter the services available for booking on the WebSites and to stop listing 3rd Party Restaurant or services. Hungry Hub may send email or SMS confirmations to confirm or follow up on bookings or to request a review or follow up feedback. Customer must cancel any bookings that they will be unable to honour at least 30 minutes in advance of the booking time. The Customer may cancel his/her booking via the WebSites or by calling the 3rd Party Restaurant directly. Any pre-payments required to finalise the booking with a 3rd Party Restaurant is non-refundable and any issues regarding this should be dealt with the 3rd Party Restaurant directly. If a Customer is unable to keep his/her booking with a 3rd Party Restaurant and he/she fails to cancel at least 30 minutes in advance of the booking time, Hungry Hub will send the Customer an email letting him/her know that our records indicate that the Customer was a no-show. By using the booking services, the Customer agrees to receive no-show notifications by email after a report that his/her booking was not honoured, whether or not that was in fact the case. The Customer agrees that all final no-show determinations will be made by the 3rd Party Restaurant in its sole discretion. Any pre-payments of the bookings failed to cancel 30 minutes in advance of the booking time is also non-refundable. To access certain functions of the WebSites, Users must register as a unique User by providing certain current, complete, and accurate information about themselves. As part of the registration process, the User will select a password and provide a valid email address as a Username. The User also has to give Hungry Hub certain registration information, all of which must be accurate and updated. The User may not (i) select or use a Username of another person with the intent to impersonate that person; (ii) use a Username in which another person has rights without such person’s authorisation; or (iii) use a Username that the Company, in its sole discretion, deems offensive. Failure to provide any requested information may delay or prevent the creation of an Account. The User represents that: (a) the information you submit is truthful and accurate and that the User has not misrepresented his/her identity; (b) the User will update his/her contact information if it changes; (c) the User’s usage of the WebSites and his/her use of services available on the WebSites do not violate any applicable law or regulation; (d) the User is 12 years of age or older. Failure to comply with the foregoing shall constitute a breach of this Agreement, which may result in immediate termination of the User’s Account. The User shall be responsible for maintaining the confidentiality of his/her password. Users shall notify the Company of any known or suspected unauthorised use(s) of their Account, or any known or suspected breach of security, including loss, theft, or unauthorised disclosure of their password or other information. Users are responsible for maintaining the security of their password. The Company is not liable for any loss that they may suffer through the use of their password by others. The Users agree to notify the Company immediately of any unauthorised use of their Account or of any other breach of security known to them with respect to the WebSites or their Account. The Users agree to report any violations of this Agreement by others to the Company. 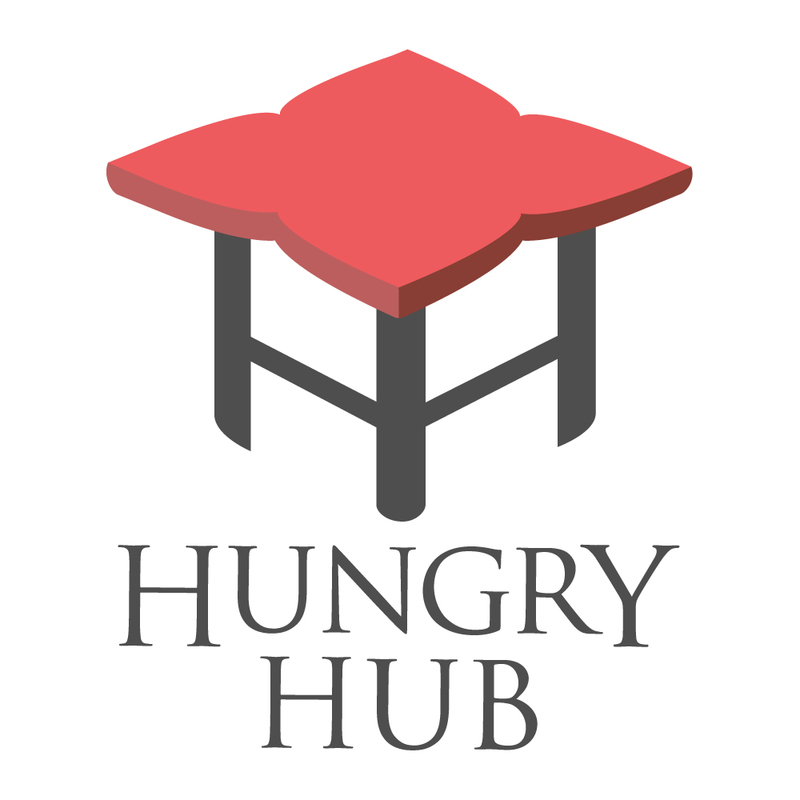 Hungry Hub services may permit Users to submit reviews, comments, and ratings, send emails and other communications; and submit suggestions, ideas, comments, questions, or other information for publication and distribution to restaurants and other third parties (“User Content”). Any such User Content must not be illegal, threatening, obscene, racist, defamatory, libellous, pornographic, infringing of intellectual property rights, promoting of illegal activity or harm to groups and/or individuals, invasive of privacy, purposely false or otherwise injurious to third parties or objectionable and must not consist of or contain software, computer viruses, commercial solicitation, political campaigning, chain letters, mass mailings, any form of “spam” or references to illegal activity, malpractice, purposeful overcharging, false advertising or health code violations. Customers may not use a false email address, impersonate any person or entity, or otherwise mislead as to the origin of User Content. Hungry Hub reserves the right (but has no obligation) to monitor, remove, or edit User Content in Hungry Hub’s sole discretion, including if User Content violates any Hungry Hub Policies, but please note that Hungry Hub may or may not regularly review submitted User Content. Hungry Hub takes no responsibility and assumes no liability for any User Content submitted by any User or third party. The WebSites may provide links to third-party web sites (“Third-Party Websites”). This Terms of Service Agreement governs only these WebSites and not any Third-Party Websites. The Company’s decision to link to a Third-Party Website is not an endorsement of the content or services in that linked Third-Party Website. The Company may not own or operate the Third-Party Website, and it has not reviewed, and cannot review, all of the material, including goods or services, made available through Third-Party Websites. The Company expressly disclaims any responsibility for the content, the accuracy of the information and any products or services available on the Third-Party Websites. If the Customer decides to access linked Third-Party Websites, the Customer does so at their own risk. The Company reserves the right and the Users agree that any information in an Account designated as “Public” may be used by the Company for promotional uses. External search engines may also index such Public information. Use of an Account does not grant a User a license to any software contained in, or used by, the Account. Users agree not to, directly or indirectly: reverse engineer, decompile, disassemble, or otherwise attempt to discover the source code, object code, or underlying structure, ideas, or algorithms of, or found at, or through, the Account or any software, documentation, or data related to the Account: remove any proprietary notices or labels from the Account or any Software, modify, translate, or create derivative works based on the Account or any Software; or copy, distribute, pledge, assign, or otherwise transfer or encumber rights to the Account or any Software. The Account shall be used for a User’s business or personal purposes only, as the case may be, and a User shall not use the Account or any Software for timesharing or service bureau purposes or otherwise for the benefit of a third party. If a User is using the Account in any country in the European Community, the prohibition against modifying, translating, reverse engineering, decompiling, disassembling or creating derivative works based on the Services or the Software does not affect a User’s rights under any legislation implementing the E.C. Council Directive on the Legal Protection of Computer Programs. Hungry Hub is happy to provide its booking API to directories and portals to enable real time bookings into Hungry Hub Restaurant Accounts, on the understanding that such directory or portal partners never place their or any affiliate company or entity’s version of a branded widget or API interface on a restaurant’s own website, in which case access to the Hungry Hub booking API may be withdrawn at Hungry Hub’s absolute discretion. Hungry Hub may provide its partners with API access/widgets to Restaurant Accounts in instances where the partner acts as a complimentary booking channel. The same applies for partners that offer a complimentary trial period in their offering. Once the trial period has ended, Restaurant Accounts that would like to continue receiving booking from the partner, will have the opportunity to do so by instructing the partner directly or by contacting Hungry Hub. If the latter has not been instructed, Restaurant Accounts will be automatically removed from the partners website/portal once the trial has ended. The Users acknowledge and agree that any and all Company or Restaurant Partner names and logos related to the Account and the Company or Restaurant and all related product and service names, design marks and slogans, are the property of the Company, the Restaurant Partner or their affiliates or suppliers, as the case may be (collectively, the “Marks”). By agreeing to these Terms of Service, the Users agree not to use any of the Marks in any advertising, publicity or any other commercial manner without the prior written consent of the Company or the applicable Restaurant Partner. The Users have no title or ownership in the account, the Software or the Marks (other than their own Marks) and no other rights in the Account, the Software or the Marks. All ownership rights remain in the Company, the Restaurant Partner or their third party suppliers, as the case may be. The Users agree to comply with all intellectual property laws and shall not encumber any interest, in, or assert any rights to, the Marks (other than their own). The User may not reverse engineer, reverse assemble, decompile or disassemble, reproduce, modify, transmit, participate in the sale or transfer of, or create derivative works based on any marks, in whole or in part. By registering for an Account, each Restaurant Partner agrees and grants the Company the right to use for these WebSites and other related purposes, all images, menus, logos, content and other information that may be found of the Restaurant’s own web sites. The Company, in its sole discretion, has the right to suspend or terminate any User’s Account and refuse any and all current or future use of the Account, or any other service of the Company, at any time for any reason, including, but not limited to, violation of these Terms of Service. Such a termination of a User’s Account will result in the forfeiture and relinquishment of all content in said Account. Users may cancel their Accounts at any time by submitting a request in writing to support@hungryhub.com Thirty (30) days notice is required when canceling. The Company may delete any of a User’s archived data with in thirty (30) days after the date of termination. All Users agree to indemnify and hold the Company, its subsidiaries, affiliates, officers and employees, and service providers unaccountable from any claim or demand, including reasonable legal fees, made by any third party due to or arising out of a User’s use of the Sites, the User’s violation of this Agreement, or the User’s infringement of any intellectual property or other right of any person’s entity. Even though prohibited, people may provide information that is offensive, false, harmful, or deceptive. The Company assumes no responsibility or liability whatsoever for such content or actions. YOU ACKNOWLEDGE AND AGREE THAT THIS SITE IS PROVIDED ON AN “AS IS” AND “AS AVAILABLE” BASIS. NONE OF THE COMPANY, ITS AFFILIATES, SUBSIDIARIES OR ITS OR THEIR OFFICERS, DIRECTORS, EMPLOYEES OR AGENTS (COLLECTIVELY THE “COMPANY PARTIES”) GUARANTEES THE ACCURACY, COMPLETENESS, TIMELINESS, RELIABILITY, SUITABILITY OR USEFULNESS OF ANY PORTION OF THE SITE. NONE OF THE COMPANY PARTIES WARRANT THAT THIS WEBSITE WILL BE UNINTERRUPTED OR ERROR FREE, THAT ANY SPECIFIC INFORMATION THAT IS REQUESTED WILL BE PROVIDED OR THAT THIS SITE OR ITS SERVER(S) ARE OR WILL BE FREE OF COMPUTER VIRUSES OR OTHER HARMFUL ELEMENTS. YOU EXPRESSLY AGREE THAT THE ENTIRE RISK AS TO THE QUALITY AND PERFORMANCE OF THIS SITE AND THE ACCURACY, TIMELINESS OR COMPLETENESS OF THE CONTENT OR SERVICES IS ASSUMED SOLELY BY YOU. The Users expressly understand and agree that the Company shall not be liable for any direct, indirect, incidental, special, consequential or exemplary damages, including but not limited to, damages for loss of profits, goodwill, use, data or other intangible losses (even if the Company has been advised of the possibility of such damages), resulting from: (i) the use or the inability to use the service; (ii) the cost of procurement of substitute food, goods and services resulting from any food, goods, data, information or services purchased or obtained or messages received or transactions entered into through or from the service; (iii) unauthorized access to or alteration of the Users’ transmissions or data; (iv) statements or conduct of any third party on the service; (v) termination of the Users’ Accounts; or (vi) any other matter relating to the Accounts. In the event of notwithstanding the foregoing, the Company is found liable to a User for damages from any cause whatsoever, and regardless of the form of the action (whether in contract, tort (including negligence), product liability or otherwise), the liability of the Company to the User will be limited to the amount that the User paid for his/her/its Account. ​The User agrees that their use of the Accounts is at their sole risk. The service is provided on an “as is” and “as available” basis. The failure of the Company to exercise or enforce any right or provision of the Terms of Service shall not constitute a waiver of such right or provision. The Terms of Service constitutes the entire agreement between the Users and the Company and govern the use of the Accounts, superseding any prior agreements between the Users and the Company (including, but not limited to, any prior versions of the Terms of Service). ​Unless otherwise provided, the Terms of Service shall be governed by the laws of the Kingdom of Thailand without effect to its conflict of laws provisions. Questions about the Terms of Service should be sent to support@hungryhub.com.